You might feel like you flip through 14 million photos a day on Facebook, but Anne Wilkes Tucker (“America’s Best Photography Curator” according to Time) actually came close at the Library of Congress. Nearly 500 of her finds are on display at the Annenberg Space for Photography, including portraits of Abraham Lincoln and Yoko Ono, and pics of bodybuilder Gene Jantzen shot by Stanley Kubrick. The biggest literary fest in L.A. happens this month, and admission is free (though if you want to reserve spaces for certain author panels in advance, you will be paying a small service charge). Always eclectic, the schedule really has something for everyone. Sessions cover topics from how classical musicians are using blockchain tech to the power of comic books. Big names in attendance include Moby, Junot Diaz, Michael Isikoff, Patton Oswalt, and many more. They may not have been duck lipping it, but this pop-up in Glendale says people were doing the whole self-portrait thing 40,000 years ago. It sheds a little light on the practice, detailing the storied history of people recreating their own likenesses. If you’re only doing it for the ’gram, don’t fret: There are plenty of interactive, selfie-friendly installations. 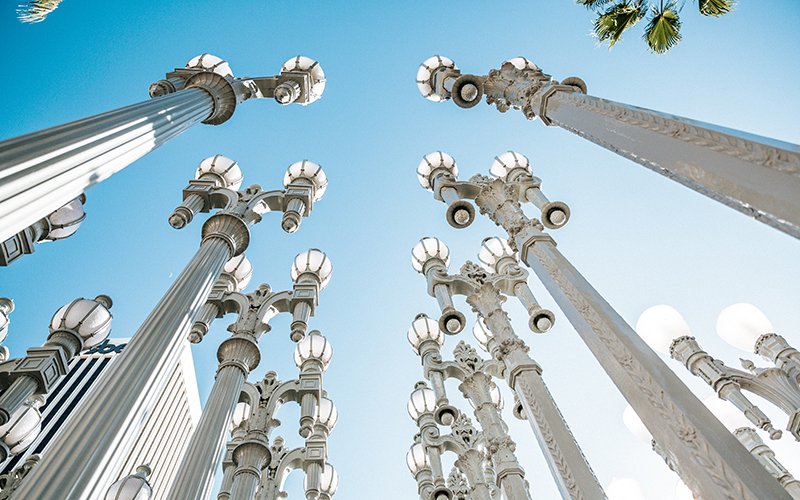 LACMA is the only museum in the country to host this exhibition, which originated in London. Most paintings were done at Hockney’s L.A. studio in what he calls “20-hour exposures”; his subjects are staff, family, and friends like John Baldessari and Benedikt Taschen. Pacific Opera Project is all about bringing arias to the people on the cheap. This month it puts on Mozart’s version of Don Juan, staging it cabaret-style at the Vortex downtown. Expect food, wine, and (thankfully) English subtitles. Friends of the L.A. River—the organization that helped get the river revitalization movement going—has made its cleanups into an annual ritual. Throw on some sneaks and head to the upper the middle portion of the waterway on April 21 to pitch in during the trash-collecting efforts; if you can’t make it this weekend, you’ve got one more chance on April 28. Zoey Taylor and David Connelly, aka Dosshaus, are artists whose material of choice is cardboard. Their latest solo exhibition brings a 2,000-square-foot flophouse that’s equal parts whimsical and seedy to life, but nothing is really as it seems. Rooms separated by “paper-thin” walls are filled with the pair’s optically confounding, cartoon-like cardboard sculptures—suitcases, chandeliers, tiny room keys—painted in black, white, and gray; the artists will even appear within their installations at set times wearing clothes made of paper and cardboard and portraying the characters their rooms are modeled after.